What in the world do you do after you've just made Pavlova and find yourself with four unused egg yolks? Here's an idea: you make pudding. Delicious, rich, not low-fat pudding. And you top it with sprinkles, as above. 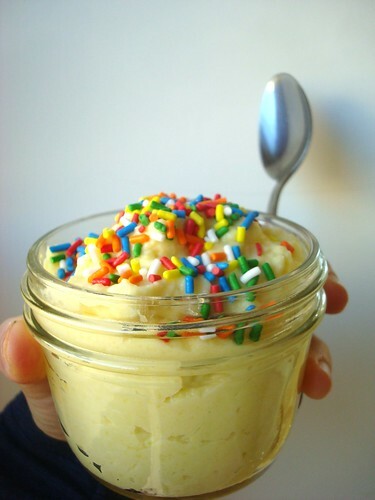 And you think to yourself, "why isn't topping pudding with sprinkles a thing?". Seriously, why not? 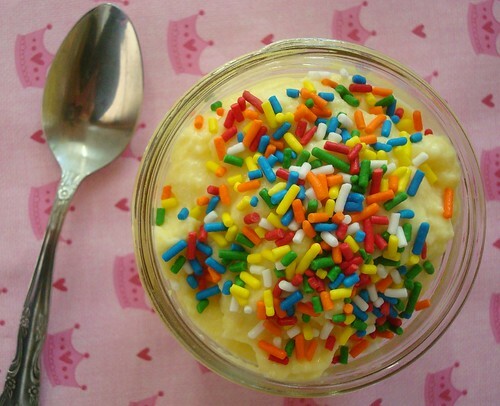 Why don't people put sprinkles on pudding? But anyway, back to the pudding. I did find myself with a few extra yolks, so I decided to pudding it up. I adapted a recipe by Baking Bites, but made it eggier with one extra yolk and didn't fuss with a vanilla bean this time (I wanted this to be quick, after all). The pudding came out unbelievably rich, and was especially pleasant served warm. Custardy and comforting and cozy. It makes me wonder: what are your thoughts on pudding? I used to be bored by it, but I guess you could say I have a somewhat newfound appreciation. It's so simple, but is capable of being so comforting, hitting the spot in a way that isn't as assertively sweet and cold and creamy as ice cream, but is more satisfying, sweet-wise, than yogurt. 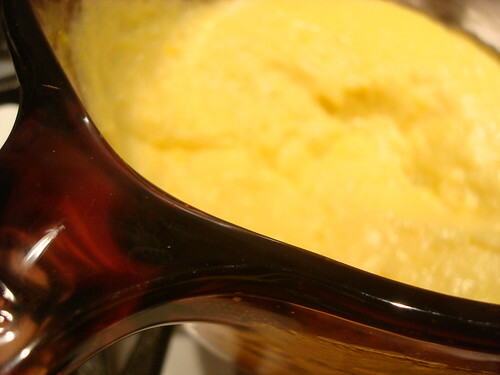 As I made the pudding, there were little flecks that remained when I tempered the eggs. I had a few spoonfuls and thought "meh, it tastes fine". But then, just as I am thinking, these little bumps are not a big deal, a thought crystallizes in my mind about what they actually are: eggy bits. Instantly, I can't get past it. Eggy bits, outta my pudding! Luckily, there is a solution. 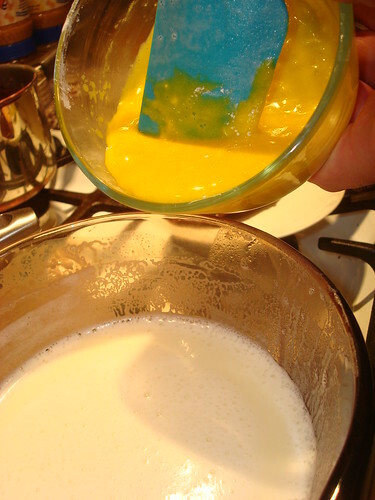 Press the pudding through a mesh strainer. Push with the back of a spoon or a spatula. 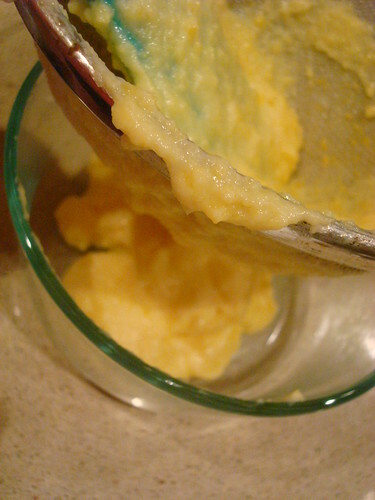 The pudding will strain through with minimal eggy bits, which will all form a deposit on the inside of the strainer. That's right: stay outta my pudding! Down the disposal with you lumps. 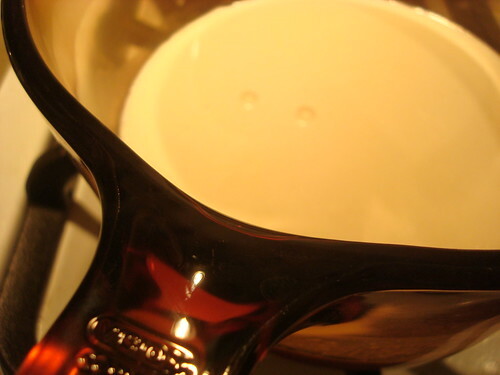 In a medium saucepan, combine the vanilla, milk, and sugar. Bring to a low boil. Remove from heat. Now, whisk together the yolks, cornstarch, and salt in a medium bowl. Whisking constantly, pour this into the hot milk mixture in the saucepan. Put the saucepan back on heat, and cook on medium heat until it comes to a simmer, stirring frequently with a rubber spatula. Cook for 2-3 minutes at a simmer, or until the pudding thickens. Remove from heat. 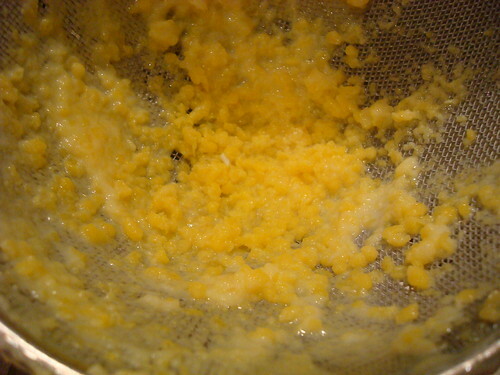 If there are eggy bits, strain the mixture through a mesh strainer to remove them. Place in serving dishes. It tastes best served warm, in my opinion. Have you ever made pudding at home?